Here we come with savings pass just for you from Crazy 8. 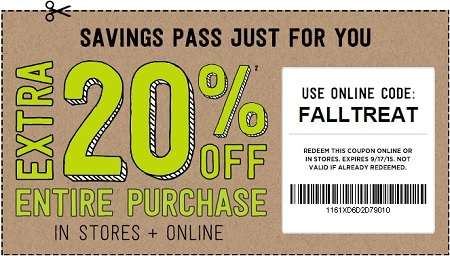 Print the savings pass, show it to cashier during the time of your purchase and take 20% off your entire purchase. Valid at Crazy 8 stores and online. To receive the offer online use promo code: FALLTREAT. Source of the information is Crazy 8. More details available at Crazy 8 stores. Find your nearest Crazy 8 store through our store locator.